To connect the individual components of the water cooling, the choice of the correct connections and their sufficient number is essential. Otherwise, installation will quickly become a frustrating experience if assembly fails on the wrong or too few connectors and is delayed due to this. Bitspower offers a comprehensive product range that offers the right solution for every requirement - whether adapters, direct hose connections, brackets or distributors. The design is solid and has a sealing ring. Thus, the connections remain tight and ensure high long-term durability. 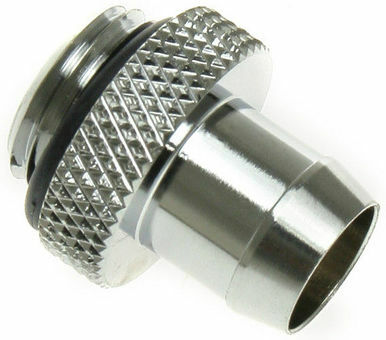 This is a straight G1 / 4 "fitting for 3/8" ID tubing or 10mm tubing in a particularly short design. Since no union nut is used, any tube thickness and thus outer diameter can be used. Note: For a better and safer fit, we recommend using a cable tie or a hose clamp.